Here is the next installment of our Halloween O' Book Characters. I have already shared the Elephant and Piggie Costumes based on Mo Willems delightful children's book series. 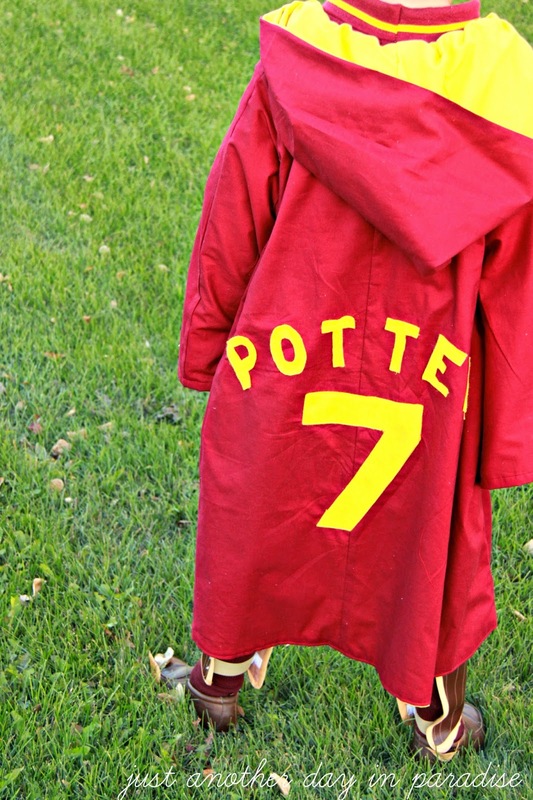 Now I am sharing this Harry Potter Quidditch costume. I mean if you are going to do a book character Halloween theme, there has to be a Harry Potter. Oldest loves Harry Potter. The Harry Potter was the first real big series that he read. He actually started the series so early that I had to stop him for a year or so at book four. He has now read them all. He has seen all the movies. He thinks Harry Potter is pretty awesome. 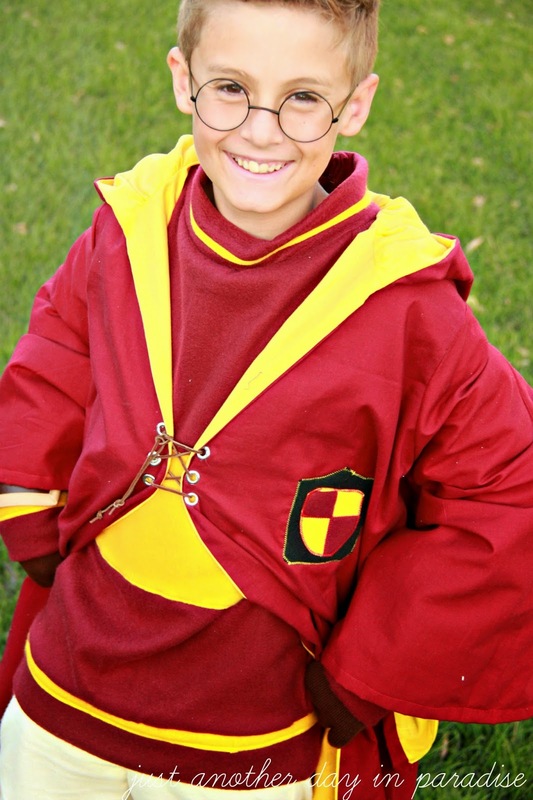 So last year when I promised him that he could choose his costume, he immediately said, "I want to be Harry Potter." 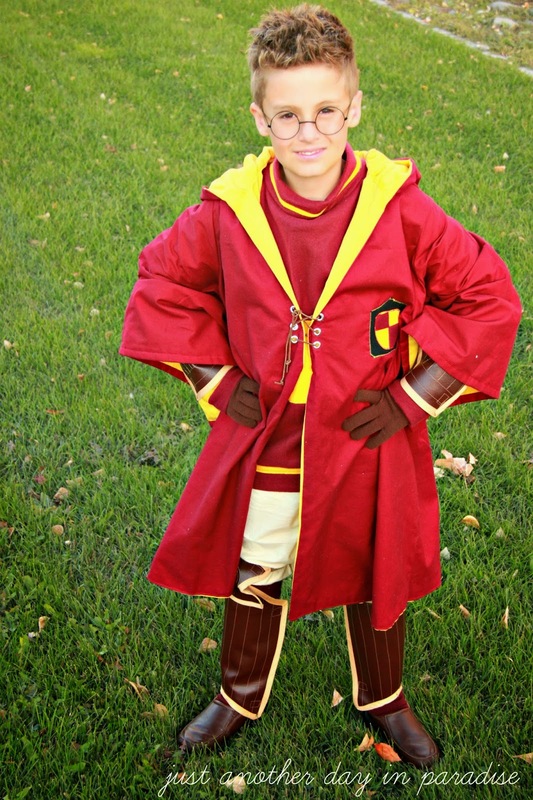 As Halloween finally approached, I talked to him about forgoing the traditional Harry Potter costume and trying to put together the Quidditch Harry Potter. He was all for it. So I started looking up pictures of Harry Potter in his Quidditch uniform and used that as my guide to creating the costume. This costume has a lot, like a lot, a lot of pieces. 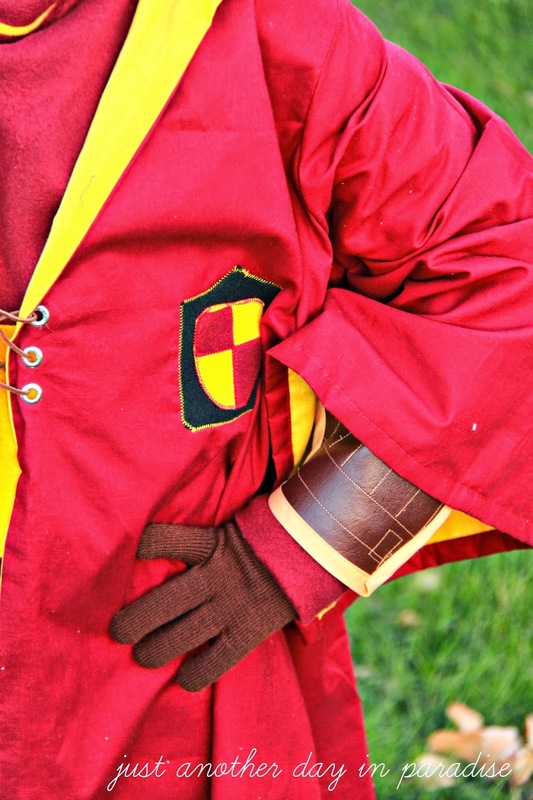 The Quidditch robe is burgundy cotton lined with yellow cotton. I did alter a robe pattern to make it. I then made a very simple patch out of felt. I used felt for the name and Harry's number. 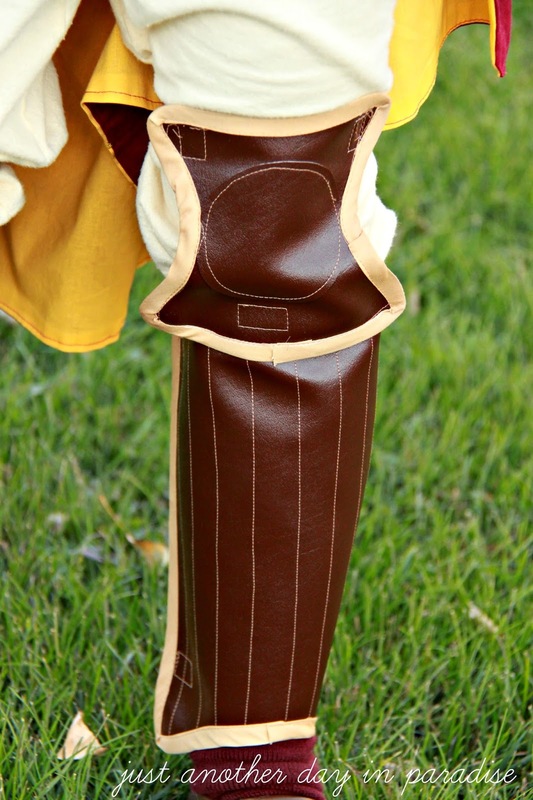 The Quidditch uniform wouldn't be complete without the leather protective gear. I used boating vinyl and biased tape to imitate the leather gear. 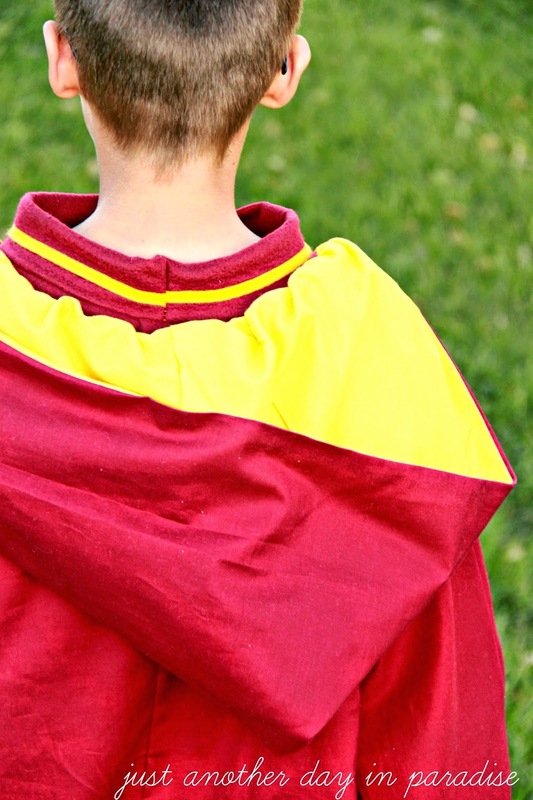 My little Harry Potter proudly sports the traditional Gryffindor colors. 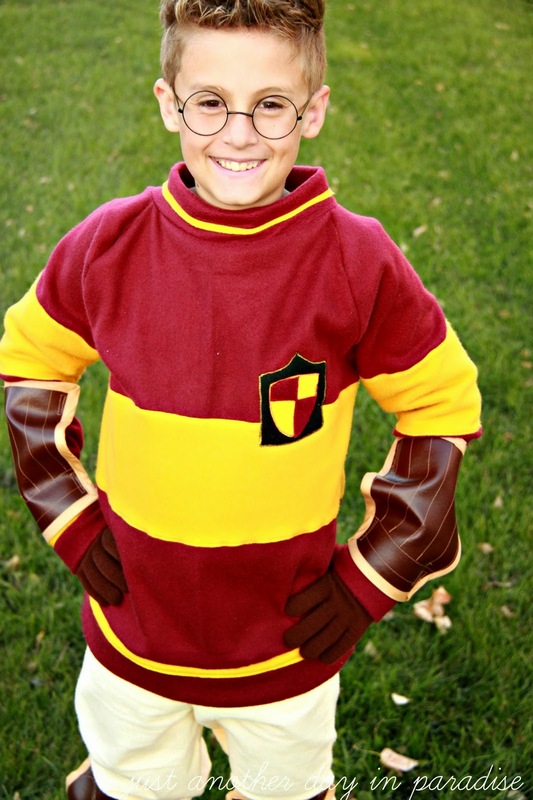 The Gryffindor Quidditch uniform sports a burgundy and gold sweater. Since I can't knit AND because I didn't want to spend $40 on a costume sweater, I whipped up this bad boy using fleece. 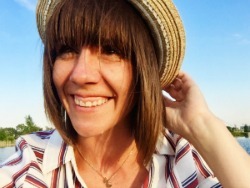 I paired it with cream pants made from flannel. Then we added in some store bought Harry Potter glasses. 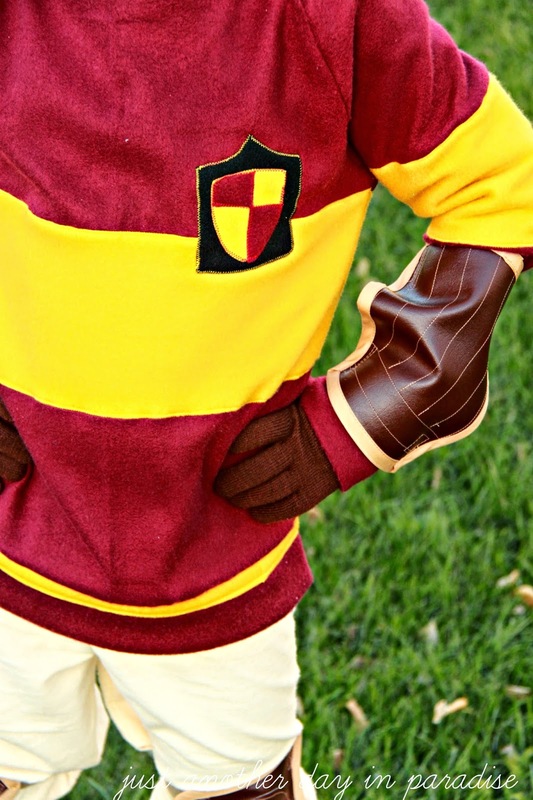 And you have the perfect Harry Potter Quidditch Halloween costume. Okay, so maybe almost perfect. We decided to forgo adding a broom to the costume. After all, who wants to carry around a broom while trick or treating. He is pretty awesome all by himself. I have one more costume left. I am excited to show that one to you...I...um...just have to finish it..er..uh start it. Ha! Great costume! Love all of the details! It is really to bad you can't go into business!